Revealed Recordings is one of the key labels to have exploded over the past few years, Revealed has become a renowned platform for some of the most exciting young talent in the scene and home to the all conquering Hardwell. In June Revealed Recordings will be returning to North America and taking their huge sound with them as Dyro and Dannic lead the way with a run of 7 shows at some of the finest clubs North America has to offer. With Dyro and Dannic’s track record growing almost as fast as their reputations, we can look forward to their unique brand of high energy dance music and an unrelenting party, as they join forces for this official Revealed Recordings North American Tour. 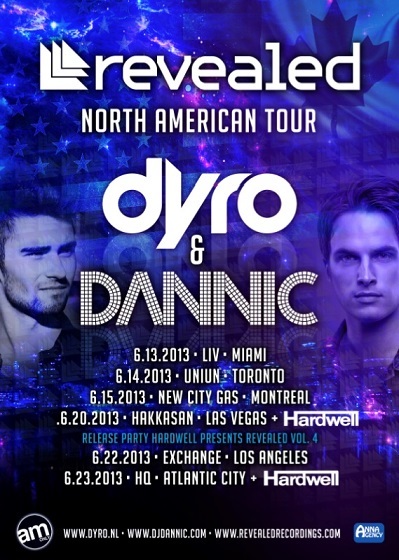 At the start of the year Dyro and Dannic joined label boss Hardwell on the first Revealed Canadian Bus Tour. Wowing crowds across the country night after night, Dyro and Dannic caused hysteria amongst hordes of fans and imbedded their names firmly into the memory of the thousands that saw them perform. Over the past few months since the Canadian tour both have taken huge strides to consolidate their reputations as two of the most exciting individual DJs in the club scene right now releasing a slew of high profiled singles and remixes, as well as performing at numerous sell out events on both sides of the Atlantic. 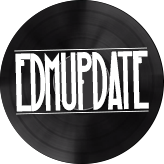 Both talents just secured a mainstage slot at upcoming Electric Daisy Carnival Festival in Las Vegas, being a landmark in their still early career and sure to underline their rising status. Dannic is clearly taking the world by storm, a statement which has been proven true once again by the recent success of his current track ‘Viper’ which spent two weeks in the Beatport Top 10. This big room banger was first aired during Hardwell’s now legendary Ultra Music Festival Miami set, which to date has racked up over 4.5 million views on YouTube, and ‘Viper’ has since become an ever present feature in the set lists of the scenes biggest djs. Not forgetting the support he has received, Dannic’s free monthly mix series has become one of the most eagerly awaited downloads each month. Previous club bangers include the Swedish House Mafia supported ‘Clobber’ and remixes for Nicky Romero & Nervo, Example, Sean Paul and Ciara. Dannic is now ready to step up for this highly anticipated North American tour. Dyro’s consistency with releases is unrivalled and for such a young producer to continually deliver such high quality tracks is something which is rarely, if ever, matched. His current release, ‘Leprechauns and Unicorns’ has been lodged in the Beatport Top 10 since dropping earlier this month. From his collaborations with Hardwell and Tiësto, respectfully, which are both due for release in the coming months to his remix projects for the likes of Benny Benassi, Kate Perry and Tiësto, Dyro is one of the hardest working and most in demand producers in dance music. 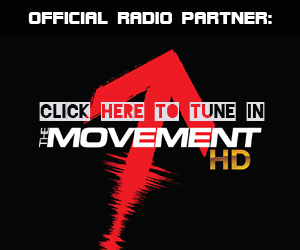 As quickly as his reputation as a producer grows so does the demand for his DJ sets, so much so he recently released his hugely requested weekly Daftastic Radio podcast to eager fans allowing himself a platform to showcase his music to a global audience week-on-week. Having blown away US audiences last month when he joined Bassjackers for a joint tour of America titled ‘Grid tour’, (named after the collaboration they did together) which saw them sell out The Exchange in LA, Dyro is set to return alongside his Revealed comrade Dannic with a bag full of heavy bangers (unreleased) which will bring down the roof!